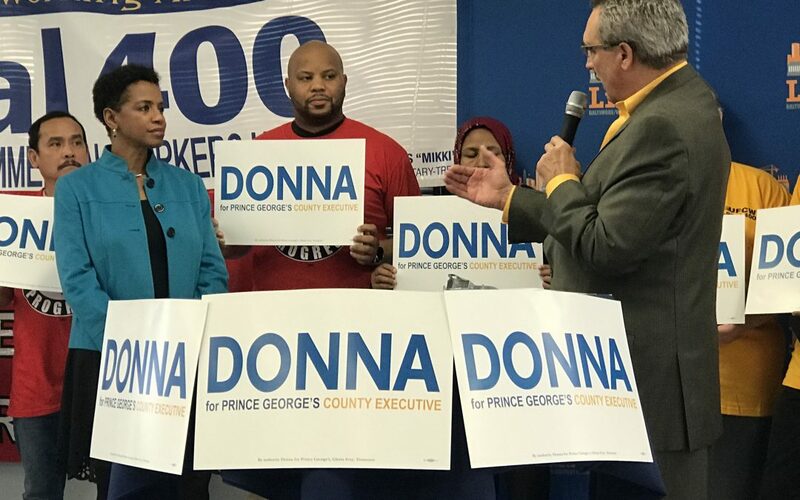 A coalition of four labor unions jointly announced their endorsement of former Congresswoman Donna Edwards for Prince George’s County Executive on November 30, including UFCW Local 400, UNITE HERE Local 25, LIUNA Mid-Atlantic, and UFCW Local 1994 MCGEO. Together, the organizations represent more than 10,000 workers in the county. UNITE HERE Local 25 is a union of over 6,500 hotel workers in the Washington D.C. area, including 3,200 members at National Harbor. UFCW Local 1994 MCGEO members provide important services for improving the lives of millions of Marylanders through their tireless efforts at the Prince George’s County Memorial Library System, Maryland-National Capital Park and Planning Commission, the Montgomery County Government, the Housing Opportunities Commission of Montgomery County, and the Cumberland City Police Department. MCGEO is a public and private sector union, representing thousands of employees in Prince George’s and Montgomery Counties and the City of Cumberland.